This will be the first ever meeting between Michigan and Connecticut. Connecticut is 4-0 in their last 4 road openers. 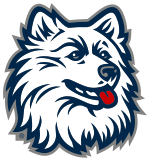 UConn transitioned to Division 1-A status in 2000. They did not however, join a conference, and competed as an independent from 2000-2003. Prior to this, the Huskies were in a Atlantic-10 conference. The Big East welcomed UConn to their conference in 2004. Not making a huge splash in the conference initially, they did manage to win the Big East in 2007 with a 9-4 overall and 5-2 conference record. Hit hard last season by the tragic on-campus murder of cornerback Jasper Howard following their homecoming game, the Huskies dropped their next 3 games before rebounding against a disheveled Notre Dame squad. Since joining the Big East, UConn has enjoyed taking advantage of the conferences bowl affiliations by going to bowls in 05, 07, 09, and 2010. The latest bowl appearance was in the PapaJohns.com Bowl with an impressive win against South Carolina 20-7. UConn plays a pro-style run first/pass second type of offense. Fans of Michigan's offense from 1969-2007 will recognize this scheme very quickly. One of UConn's biggest strengths is it's rushing game, which has averaged 2000+ yards rushing each of the last 4 years. Much like Michigan the last couple years, their rushing game has been by committee. Junior RB Jordan Todman rushed 235 times for 1188 yards, 14TDs. Andre Dixon, now graduated, split time with Todman, both RBs stats were about the same. Junior RB Robbie Frey could see some action in Dixon's absence. He had a minor role in 09, rushing 5 times for 69 yards and 2 scores. Senior QB Zach Frazer played 9 games last year for the Huskies, passing for 1461 yards, 10 TDs and 9 INTs. Expect to see Frazer exclusively, because backup Cody Endres has an indefinite suspension which will keep him out of this game. Frazer did finish the season strong for the Huskies, leading them to 4-straight wins at ND, Syracuse, South Florida and against South Carolina in their bowl game. UConn will use Frazer's experience, and size (6-4, 231) to try and outgun Michigan's young and inexperienced secondary. If Frazer has a good game, say...20 for 30, 250+ yards and a couple TDs, this game will be much closer than anyone would like. History has shown that Frazer can be rattled, like he was against Rutgers last season, throwing 3 picks, a 45% completion percentage, but still throwing for 333 yards. Of course he did toss it up 46 times for a season-best 21 completions. Don't expect Frazer to do any damage with his feet. Last year he had 17 carries for -28 yards. Make no mistake though, the strength of this offense is the ground game. UConn will use 3 or 4 guys to try and fill the role of departing senior WR Marcus Easley. 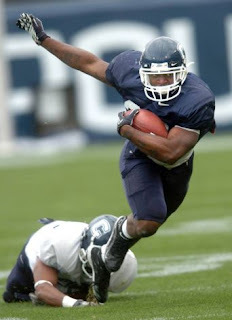 Easley was by far the best receiver UConn had to offer in 09, so it's going to be open tryouts for guys like Kashif Moore, Michael Smith and Isiah Moore. Of those 3, Kashif Moore probably has the most big-play potential, and will likely be the main target for Frazer throughout the season. TE Ryan Griffin, if healthy - which it sounds like he might not be, would also be a nice option for the senior QB as well. If Griffin is out, John Delahunt and recently converted LB Andre Opoku could see some action. The OL is led by Zach Hurd, who will likely end is career playing on Sundays. This unit is pretty solid with experience and depth (for a lower-level Big East team), but there are few holes up front for UConn. Mike Martin, Will Campbell and company will have their hands full, but shouldn't get outplayed by this unit. One area of concern if your a Michigan fan is that our defense has not played against an offense like this since late last season. And in fall-camp, we've only seen our own spread-option type of attack. UConn is a downhill type of attack that might give us fits early, especially with only 3 defensive linemen up front. From simply a statistical standpoint, UConn's defense from 09 wasn't the greatest. They gave up an average of 368 yards per game, #62 nationally and 6th in the Big East (Michigan gave up 393 ypg). UConn was pretty much below average among Big East teams in all defensive categories. Passing defense was ranked 88th in the nation, while rushing D was 45th. The first thing that sticks out to me about UConn's D is the lack of seniors. LB Scott Lutrus is the lone senior as far as I can tell. They feature 3 freshman in their backfield and 1 Freshman defensive end and 1 freshman linebacker. Add in a couple sophomore DTs, two junior LBs and a junior safety, and you basically have...Michigan's defense minus the experience. So basically, the 6th (of 8) best defense in the Big East just got younger and more inexperienced. The biggest standouts of this defense (by farrrrrr) are LB #8 Lawrence Wilson and LB Scott Lutrus. Wilson had 140 tackles last year, 11 for loss, 5 sacks and 3 forced fumbles. Aside from those two, no one else in the top 5 in tackles from the 09 team is back. Linebacker Greg Lloyd will redshirt this year after badly injuring his knee late last season. DBs Robert McClain and Robert Vaughn and DT Lindsey Witten are gone. In their places...nothing but inexperience and more inexperience. I'm not usually one for bold predictions, but I suspect Michigan's OL will eat this defensive front for lunch and enjoy a couple of the freshman DBs as desert. For UConn to have a chance at stopping Michigan's much improved offense, these young men will need to play the game of their lives. 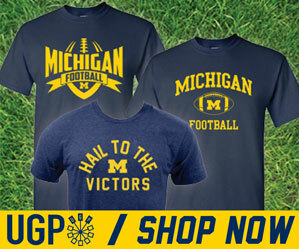 Given that Michigan is their biggest game of the season...they might just do that. You better believe UConn has visions of Appy State in their heads right now. Again, more youth. Sophomore Dave Teggart returns as the placekicker after going 47/47 in extra points last year, and 14/23 in field goals. UConn has two punters who are both freshman. RB Jordan Todman will return kickoffs and Gary Willburn will field punts. I have little doubt that UConn will be able to score some points. They have a proven leader in Frazer at QB and a capable running attack with a decent OL. They're a little green at WR, but could show some signs of life if Michigan's secondary proves to be as bad as we fear. However, UConn might be the 2nd best defense in the stadium on Saturday...which is really saying something. At least we know that they are younger and more inexperienced then we are. That could prove to be the deciding factor in the outcome of this game. Whomever we line up at QB should be able to move the ball well through the air against a very young secondary. As long as we can keep Wilson and Lutrus in check, we'll be able to run the ball well. I won't predict a final score, but a win by two scores is surely a possibility. I've had this game marked as a win since the spring game. Before then, I was skeptical that our offense would be improved enough. But after seeing Denard, and our OL...I have little doubt that Michigan can take care of business before the day is through. Hopefully we'll get a good look at Denard, Tate, and even Devin. Expect to see a lot of running backs, receivers, and even offensive linemen cycle through this game. It's not going to be pretty at times...especially on special teams where we have a new punter, and a bevy of young placekickers. But if we can win the turnover battle and limit our mistakes, hopefully we can make the Huskies pay for theirs.